I associate rattan chairs with Florida. Comfortable? Yes. Hip? Not really. Until now that is. 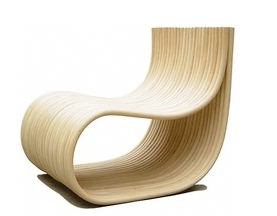 This Stomach Rattan Lounge Chair has a beautiful line that cascades down from the top and falls onto floor. While I do see the resemblance to a stomach, frankly speaking, I don't think the name does justice to the fluid line of the design. I can see this chair on a concrete floor in a Soho loft next to a large vertical painting. The price isn't too bad either. You can find it at Inmod.